The Barking Crab is a high-volume restaurant that is casual with everything except SERVICE. It is our mission to ensure all guests have the absolute time of their lives, and we rely on our TEAM MEMBERS — our most important asset — to make sure we achieve this mission. If you have the necessary experience, think you have what it takes and are able to demonstrate genuine hospitality, we invite you to apply today. Please note: all employees must be T.I.P.S. Certified (Training for Intervention Procedures). 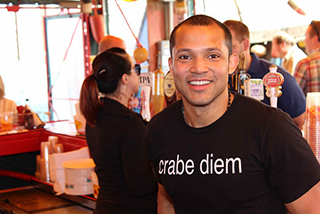 Please send your resume and cover letter to Boston@barkingcrab.com.